You are at:Home»Cryptography»How is Digital Signature used with a Document? How is Digital Signature used with a Document? A digital signature scheme is primarily a mechanism of making sure the digital documents (such as email, contract documents etc) are not forged in between (integrity) when exchanged between two entities. In addition, it solves the problem of non-repudiation (when a person disagrees that he/she did not sign the document). A digital signature is nothing but a sequence of numbers which get generated with a document and later used to verify whether the document is signed with the appropriate private key. Creation of private-public key pair using key generation algorithm. The public key, as per the name, could be shared with the world. The private key remains private to the user. A document signing function which generates the digital signature. The function takes the document and private key as input parameters and generates signature as output. 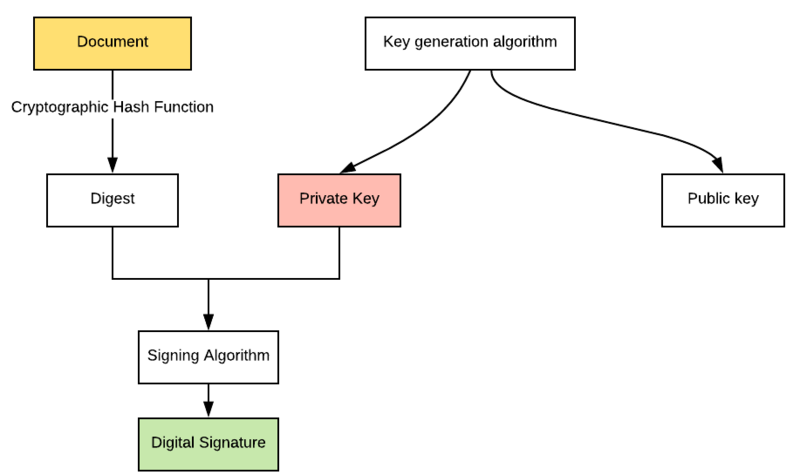 A signature verifying function which ensures that document is signed with an appropriate private key by passing the input parameters as document, signature and public key. How is Digital Signature created? A key-generation algorithm is used to create a private-public key pair. The document along with the private key is passed to a mathematical function (signing algorithm). The mathematical function generates a sequence of numbers/characters which represents the digital signature of the document. Alternatively, instead of using the plain document with a private key, the digest of the document along with private key is used to generate the digital signature. The document is passed through a cryptographic hash function which generates the fixed-length digest. How does the Document with Digital Signature is verified? The document along with digital signature is sent to the other person. 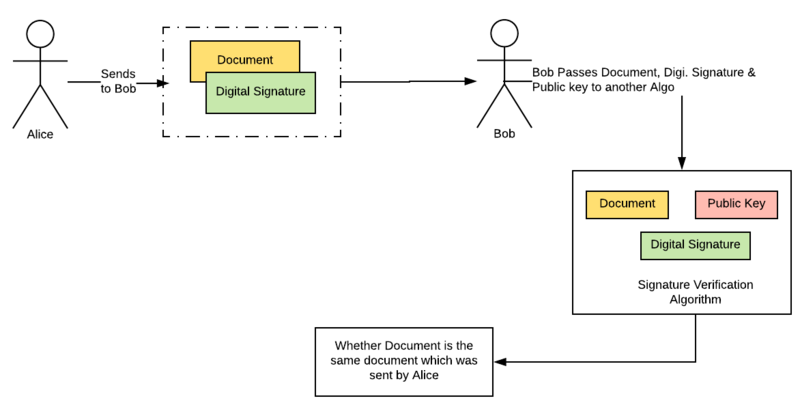 In the diagram below, Alice creates a digital signature of the document and sends the document along with the digital signature to Bob. She also shares her public key to the Bob. The other person, Bob in the diagram given below, passes the following to another mathematical function (signature verification algorithm) which returns the response related to whether the document is signed with the same public-private key pair. In this post, you learned about digital signature scheme including how digital signature is created and used.